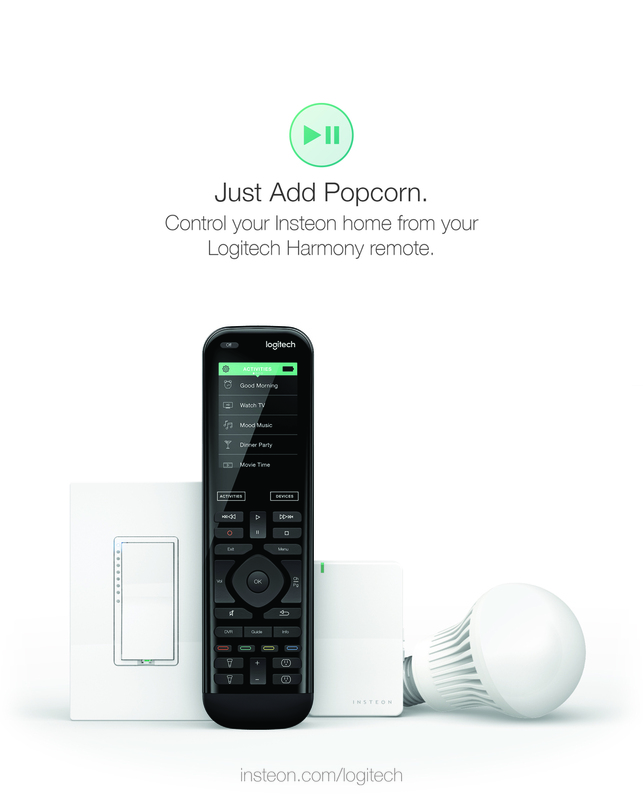 IRVINE, California – August 13, 2015 – Insteon®, creators of the world’s premier home automation and control technology, today announced that you can control Insteon devices with all Logitech Harmony® Hub based remotes, including the Logitech Harmony® Ultimate Home, the Logitech Harmony® Home Control and the Logitech Harmony® Home Hub via the Logitech Harmony mobile app. Now, you can control your Insteon connected home from the comfort of the couch while incorporating entertainment devices and home automation products from other manufacturers. Using Harmony hub-based remotes, you can now control Insteon wall switches, outlets, plug-in dimmers, lightbulbs and more. Better still, using Harmony Activities, you can create scenes like “Movie Time” that turn on your TV and Apple TV or Roku and start dimming the lights – all with one button on your Harmony remote. All that’s required is a Harmony Hub based remote, an Insteon Hub (2245-222) and Insteon devices. Insteon is the world’s best-selling wireless home-control networking technology and has been in business for more than 20 years. Common applications include remote-control HVAC, timers, lighting, cameras, leak sensing, humidity sensing, occupancy sensing, garage-door sensing and control and more. Dual-band Insteon signals communicate simultaneously via radio waves and a home’s electrical wiring, making Insteon 100 times more reliable than competing connected home solutions. For more information, please visit www.insteon.com/logitech or www.myharmony.com.